A "street smart" look atincident management in all its permutations Incident Management Systems (IMS) provide the means by which to coordinate the efforts of individual agencies in order to stabilize an incident and protect life, property, and the environment. Born from the FireScope project of the late 1960s, which was developed in response to the major wildfires that regularly plagued Southern California, these systems have evolved with many similarities and certain fundamental differences. 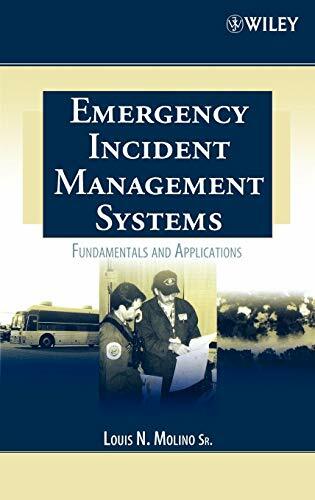 Emergency Incident Management Systems: Fundamentals and Applications contrasts the major forms of Incident Management/Incident Command Systems. The author illuminates these differences and offers a fresh perspective on the concepts on which these systems are founded in order to make them more accessible and user-friendly. Without suggesting major changes in the systems, he bridges the gap between their theoretical and academic foundations and their real-world applications, and makes them more applicable to the professional's daily needs. Timely features of the book include: An "in the field" point of view Coverage of incidents of mass destruction Filled-out sample forms designed to aid professionals in completing reports In post-9/11 America, where incident management has become a national priority-one that must be easilyunderstood and applicable across all emergency systems-this book provides a useful tool for helping today's emergency workers be more informed and more prepared than ever.